DERIVATION: from the Latin tursio for an animal like the dolphin; from the Greek ops for face; from the Latin truncare for cut off. Visit our Store for Dolphin Gift Items. A question often asked is what is the difference between dolphins and porpoises. A general rule to differentiate between them is the shape of their beak or nose. Porpoises tend to have a blunter shaped face, lacking the distinguished beak of dolphins. The dentition of the two also differs. Porpoises have spade-shaped teeth while dolphins have conical-shaped teeth. Bottlenose dolphins display perfect examples of these "dolphin-like features." In all areas where bottlenose dolphins have been studied in the wild, there appears to be two populations: coastal and offshore. Differences between them have been studied and continue to be explored, but presently there exists no conclusive information distinguishing these two populations. Bottlenose dolphins usually form groups of fewer than ten (coastal) or 25 (offshore) individuals, though groups of several hundred have been reported from some offshore areas. Males reach sexual maturity at 10 to 12 years; females at 5 to 12. Females bear a single calf every second or third year with a gestation of about 12 months. Calves nurse for a year or more. They are closely tended by adults during the first six months of their lives. "Babysitting" has been observed, in which nearby adults remain with a calf as its mother forages for food. As they age, young dolphins become more independent, tasting scraps of food in the wake of feeding adults and gradually learn to hunt on their own. Echolocation and other feeding-related behavior is most likely learned during this period of weaning. Coastal bottlenose dolphins feed on a variety of foods, eating a wide variety of fish and invertebrates. They have adapted their feeding strategies to take advantage of human activities, eating netted fish, trash fish discarded by fishermen, and fish attracted to piers and idle boats. Offshore bottlenose dolphins prefer a squid diet and often travel with groups of squid-loving pilot whales. The color of bottlenose dolphins is a subtle blend of brown to charcoal, with lighter sides and a light belly. Variations of color include all black, albino, and cinnamon-colored dolphins. Spots are present on some individuals. Teeth number from 18 to 26 in each row. In older dolphins, teeth are often worn down, particularly in coastal populations, probably reflecting differences in diet and feeding habits between the two populations. Males are larger than females. Length at maturity is 11-12 feet; females are slightly shorter. They dorsal fin is moderately tall and falcate. Bottlenose dolphins are mostly cosmopolitan and absent only in polar regions. They are the most familiar marine mammal in the world as bottlenoses are the most common captive species found in hotel tanks, amusements parks and oceanariums throughout many countries. These are the dolphins that often befriend humans in the wild, as their curiosity and coastal range brings them into frequent human contact. In New Zealand, a bottlenose would come into shallow water, play with children, and even let them ride on its back. "Georgy Girl," a female bottlenose in Florida, did this same behavior The T.V. star "Flipper" captured the public love and admiration of dolphins, but unfortunately for them, this has become a fatal attraction. Captive dolphins are often cramped abused, isolated, exposed to human disease, malnourished, and always have a shortened life. One of the "Flippers," Susie, was sold to a traveling show. She died from exposure while being exhibited at a German shopping mall in the dead of winter. 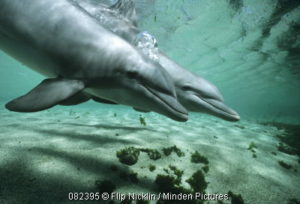 Spotted Dolphins Echolocating and Eating from Sally Bartel on Vimeo. This video was shot at White Sand Ridge, Bahamas. At night, wild spotted dolphins come in close to feed on fish and squid that are attracted to the bright lights from the boat, Dolphin Dream. You can hear the different echolocation sounds that the dolphins make as they search for and close in on their prey.